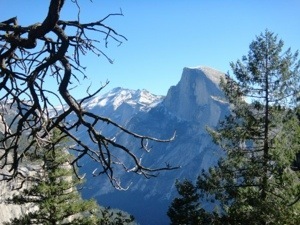 My GF, her husband, and I did this hike back in 2011. It was the perfect day in September to hike this trail. The weather was beautiful and not a cloud in the sky. The only problem we ran into was a bit of snow toward the top of the trail. We were not prepared with the proper shoes. When hiking always have layers and proper shoes for what ever you may encounter. Begin at Glacier Point parking area. 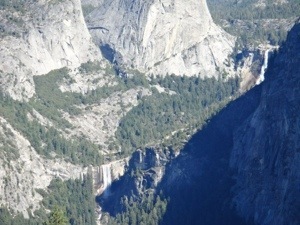 This route to Yosemite Valley brings hikers past Illilouette, Nevada, and Vernal Falls. After descending 1,300 ft (400 m) to Illilouette Fall during the first 2.0 miles (3.2 km), the trail climbs nearly 800 ft (240 m) to gain the Panorama Cliff ridgeline. 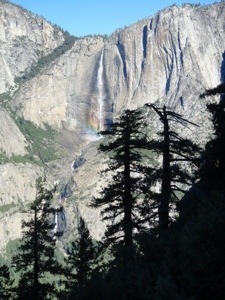 Next, a 600 ft (175 m) descent leads you to the intersection with the John Muir Trail above the top of Nevada Fall. You now have two choices to reach Yosemite Valley: a left turn follows the John Muir Trail downhill for the remaining 3.3 miles (5.3 km), while a right turn crosses the brink of Nevada Fall before passing Vernal Fall enroute to Yosemite Valley over 2.9 miles (4.7 km). I have added a few of our pictures.